There were two ways of achieving moulded designs with gourds. The first is known as the primary mould system and involves the direct carving of sections of wood that are then tied around the fruit. This method achieves excellent results, but limits the use of a single set of moulds to producing only one vessel per season, and the sets may not last for much more than a single season, as the wood panels are exposed to the elements for many months. To counter this drawback, at some time during the mid-Qing period a secondary mould system was developed, used mainly to mass produce the vast number of cricket and katydid cages that were required as the hobby of keeping these chirpy little insects became both widespread and very popular. The secondary mould system involved making a wooden master mould in several sections that could be bound together around a central, square-sectioned core. From this master mould identical clay moulds could be produced time and time again. After the master mould was fitted together, clay was wrapped tightly around it, conforming to whatever relief design was carved on the master mould. After the clay dried, the wooden master mould was unbound and removed piece by piece from the clay, which, after firing, was then ready to be tied around the growing fruit. The master mould could be reused to produce more secondary moulds. The fruits pressed into the clay moulds as they grew, taking on the relief designs of the primary mould: a positive image on the wooden mould produced a negative image on the inside of the secondary mould, which in turn shaped the fruit into a positive image. The more wooden sections there were, the narrower the neck of the final product could be; fewer sections meant wider sections, and wider sections required a larger opening for removal. For a master mould for a cricket cage, also showing it dismantled, see JICSBS, Autumn 1989, p. 15, figs. 5 and 6. 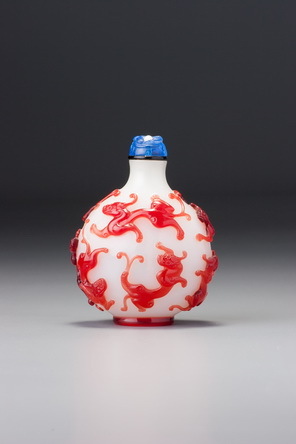 As a rule, snuff bottles were made from primary moulds, but from the mid-Qing a few were made from secondary moulds. This is one of them. The foot retains a very clear impression of the nine parts that made up the master mould: the centre piece, square in section, surrounded by the others that have rounded outer edges. 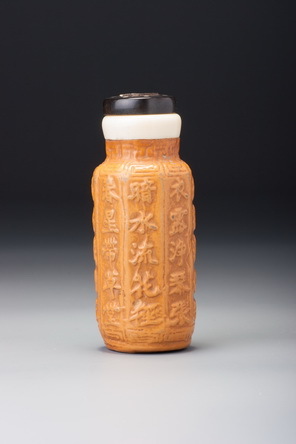 We can be certain of the date of this bottle because it is from a master-mould system, which would suggest it is unlikely to date from earlier than the mid-Qing, and another bottle from the same master mould has a Daoguang reign mark. Two from this master mould are illustrated in Wang Shixiang 1993 (p. 218, plate 38), and one bears the reign mark on the foot. How is it possible for only one bottle out of three, all taken from the same master mould, to bear a mark? The answer is that in the case of the reign-marked examples a separate panel for the mark seems to have been inserted at the base of the secondary mould. The diameter of the area of the mark inside the broad footrim would be no greater than the diameter of the neck before being fitted with an ivory lip, so it could be easily inserted. The only difference, apart from the mark, would be that the foot would be recessed to a greater extent to allow for the extra mould segment, and that is precisely what we find. Here the foot is a protruding flat one, whereas the marked example is recessed by a few millimetres. This technique would allow for multiple bottles from the same master mould to be both marked and unmarked. What is amusing about this rare little group of documentary bottles is that although the lines of characters seem identical, and are obviously taken from a single master mould, their sequence differs. The Daoguang-marked example has the lines in the correct order, as far as we can tell from the illustration; the other, unmarked example and this one do not. Here, two segments are out of order so that the line sequence is 5-2- 3-4-1-6-7-8; if facets 1 and 5, on opposite sides of the bottle, were exchanged, the poem could be read correctly. My robe dew-moistened as clear notes flow from my qin. Spring stars shimmer above the thatched hut. Examining my sword, I take the wine in long quaffs. And my intention to sail there in a little boat comes again to mind.